What to do in Palm Springs…. Well my friends they don’t call it the Desert Playground for nothing- there is so much to do in Palm Springs that your holiday will be action packed. For the golf lover Palm Springs, Palm Desert and everywhere in between boasts oodles of courses- in fact there are 32 courses within the Palm Desert city limits! There is also the Palm Springs Aerial Tramway, rotating gondola cars taking you over 5800ft from the valley floor- that is 2/3 of the way up San Jacinto Peak! You can jump on a myriad of hiking trails varying in time and difficulty. There is also the Living Desert Zoo where you can get close to animals living on land similar to their natural habitats! There are also adventure tours which take you to the San Andreas Fault! I am sure all of these things are amazing…I can’t say for sure because…we very happily did nothing!! Yep our day went something like this…..I woke up and headed out for a latte and dug into a couple chapters of my book. I read “My Life in France” -Julia Child’s book-FUN! Seriously delicious read! Then I would meander back to the hotel and search out Darek. We would then head to the pool and spend a considerable amount of time ensuring that our tans were even! By the way- I found this great tan accelerator called Maui Babe- from Hawaii- you can find it in Palm Springs and it is liquid gold! Now you do apply sunscreen first-the accelerator simply helps your tan even out! I was a lovely shade of healthy copper by the time we left! A word of warning about the desert sun- it is hot and powerful. Darek decided to go without sunscreen and was a lovely shade of lobster red from head to toe. The real fun started after the sun set and the burning of the skin began. We had to go to the pharmacy and get Solarcaine and Darek hastily stripped to the near buff in the parking lot begging for a spray of relief! After reading a couple of chapters of my book, it would be time for a drink….so we headed to a cafe for mid afternoon snacks and margaritas. 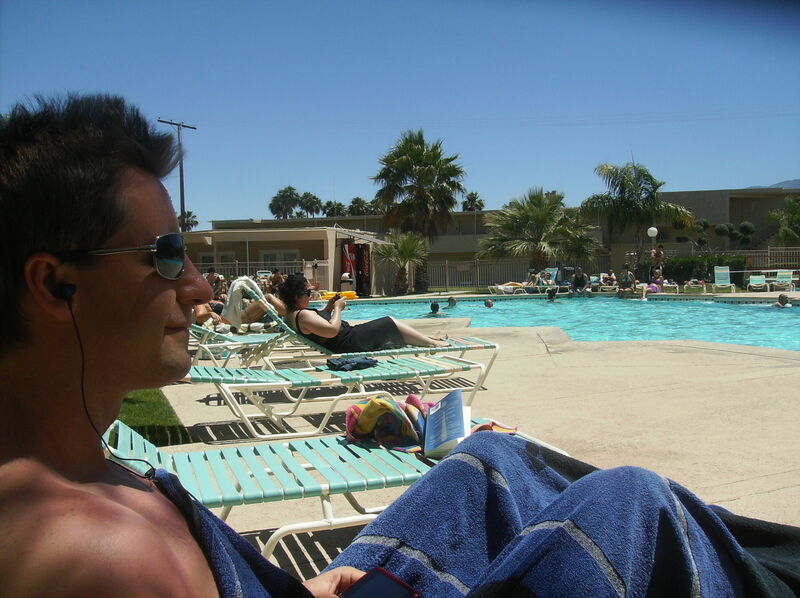 Then it was back to the pool to ensure we got a sufficient amount of vitamin D! After a gruelling day of reading, sleeping, swimming and tanning we were well hungry and headed out for an appetizer of corn chips and margaritas! By 8pm the weather had reached a temperature that was much more conducive to eating and we would head out for a glass of wine and dinner. So as you can see, how on earth would we have ever fit in hiking, sight seeing and golfing? !